← More Bento Stuff to Giveaway! 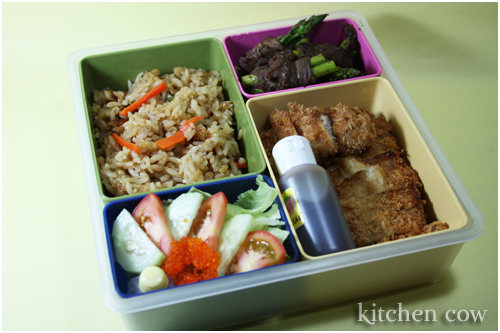 I always thought of bento as a creative way of packing lunch to bring along with you. Surprisingly enough, it never occurred to me that it was also a great way to share food with others. Instead of just sticking food in a plain Tupperware or take-out bag, arranging it nicely in a bento box adds flair and makes it more delightful. We had copious amounts of food leftover from a large dinner I cooked sometime ago, so I decided to let J bring some home. We had kamameshi, a steamed rice dish that’s loaded with all sorts of yummy stuff like meat and veggies. Only, it’s not as traditional as it usually is since I cooked it in a rice cooker, instead of the cast iron kamameshi pot. For this version, I added lots of shitake mushrooms, sliced green beans and carrots. I wanted to add ground chicken as well, but J argued that we could skip it because we had two meat dishes lined-up already. To go with it, I cooked some Gyu Asupara Maki, asparagus and beef rolls, that’s drizzled with a teriyaki like sauce. I never tire of eating it and because it’s relatively easy to prepare, I chose to cook it as my vegetable dish. Of course, the star of the night was tonkatsu, hands down, J’s favorite Japanese dish. Incidentally, it was the first one I learned to cook, back in my mid-teens. Of course, it won’t be complete without the requisite Bulldog Tonkatsu Sauce sauce so, I made sure to pack some in a little squeeze bottle as well. Lastly, to round the bento box off, I added a small fresh salad with iceberg lettuce, plum tomato slices, cucumber slices and ebiko (shrimp roe), drizzled with a Japanese soy and shiso (perilla) based dressing. Sharing food has never been this pleasing to the eyes, I bet. Of course, there’s the matter of getting your bento box back, but then, there are disposable boxes you can use. I guess it’s all a matter of how you put it together. That and the generous, thoughtful act of sharing. Do you have a recipe for kamameshi? Or do you just put all the ingredients with the rice in the rice cooker and hope for the best? I do! I was going to post it until I realized…how do I explain away 1 takal of rice? I’m trying to standardize the recipe and be sure to post once that’s done. It does look colorful and appetizing. The way you arranged the containers reminds me of the Laptop Lunch boxes. Man, that food looks so yummy! They do look like Laptop Lunch boxes don’t they? I picked them up for a dollar each at a local trade fair. I regret not getting more though, they had other shapes even. The only problem with this box is that it doesn’t have a seal on top, but then, with a bento belt or even just a length of ribbon, I’m all set with it.